According to Beverley-born Harriet Cross, the British Government’s Consul General to New England, there has never been a better time for Yorkshire businesses to export to the US. Harriet, who is based in Cambridge, Massachusetts, made the comments during a visit to Leeds last week when she and Kirsten Chambers, Consul and Head of Trade & Investment at the British Consulate General, shared updates on export and trade opportunities across the Atlantic with Yorkshire businesses. The event, hosted by Clarion, was organised by ExportExchange, a peer-to-peer mentoring initiative aimed at supporting overseas trade in the region, and was attended by a number of fledgling and experienced exporters. Harriet, who is also a patron of the ExportExchange network, said: ““Having been born and bred in Yorkshire, I understand the region and its strengths, and can clearly see how well-aligned it is with New England. 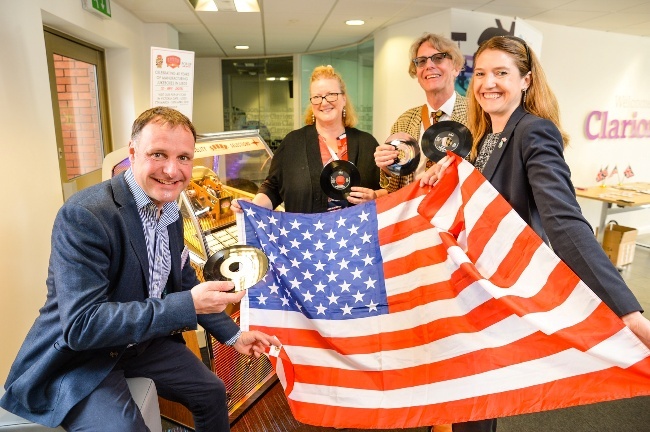 Two companies which are successfully doing business in the States, Leeds-based jukebox manufacturer Sound Leisure and plastic storage box manufacturer Really Useful Products in Normanton, shared their experiences. Chris Black, managing director of Sound Leisure, a 40 year old family business, said: “There’s always an element of risk when entering a new market as well as challenges, such as complying with different regulations, however, the opportunities are huge. Mike Pickles, founder and CEO of Really Useful Products which has grown into a £40m turnover business, has traded in the US for the last 14 years. He said: “The US is an immense market and some UK companies have stumbled because of an inability to scale up or to cost-effectively manage the logistics. As we only do national deals, we have to be certain that our production can cope with demand, and we have set up our own distribution warehouse in Chicago to enable us to reach our customers.